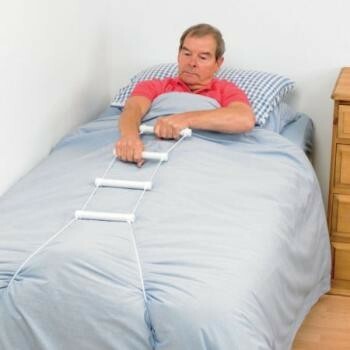 This simple rope ladder attaches under the legs or castors at the end of a bed and allows the user to easily and simply pull themselves upright into a sitting position without assistance. Features comfortable, wipe clean plastic rungs and synthetic rope. Suitable for all bed sizes. This simple rope ladder attaches under the legs or castors at the end of a bed and allows the user to easily and simply pull themselves upright into a sitting position without assistance. Features comfortable, wipe clean plastic rungs and synthetic rope. Suitable for all bed sizes. Cord length: 3m (9ft 10").